This year the mushroom hauls have come in a perfectly regular sequence of hit-miss-hit-miss, and I have thought a lot about just how much it is possible to ‘know’ a particular spot’s capacity for pushing up the mother lode. My first serious forage of the year, at the end of August, was supposed to be my way of introducing a friend to the thrills of foraging by jumping in at the deep end, with earthy handfuls of rich late summer fungi. The spot I chose was a well-known chanterelle/bolete nest, where I have regularly been able to quite nonchalantly spend the afternoon taking only the very best specimens, trusting in the consistent fruitfulness of the forest floor. This time, however,despite near-perfect weather, we found nothing conventionally edible, and a sorry guide I must have seemed to my fledgling forager. One week later I was foraging the ingredients for a pre-booked dinner with the urban farm’s head chef Pierre. The guests had been promised wild mushrooms and we absolutely had to come home with something. We went to a different site than the aforementioned one. Half an hour of quite frenzied searching among some very regimented but beautiful Scots pine was unrewarding. Then, on the fringe between pine and deciduous trees, a rich seam opened up, and clusters of bay boletus seemed to be everywhere. Where there was a gentle upward slope, the mushrooms seemed almost to be pouring down the hillside in droves. We took two rucksacks of bays and didn’t see another choice edible in over two hours, which was no problem at all, seeing as we had more than enough for the dinner course. 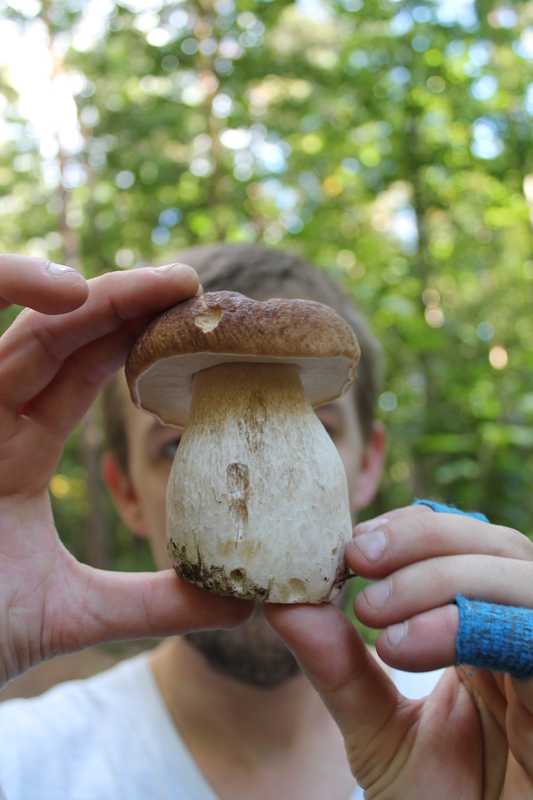 Bay boletus – get them while they’re small and firm in the cap. Roughly two weeks after that, I was called up by Seb and Dylan, two young ‘pop-up’ restaurateurs from Vancouver, who wanted to spend the day foraging for wild edibles, which they planned to cook in an improvised session at their restaurant that same evening. Again, the weather was all but faultless, and I imagined on the strength of the last forage and the similarity of conditions – though at a different site – that we were in for some choice stuff. 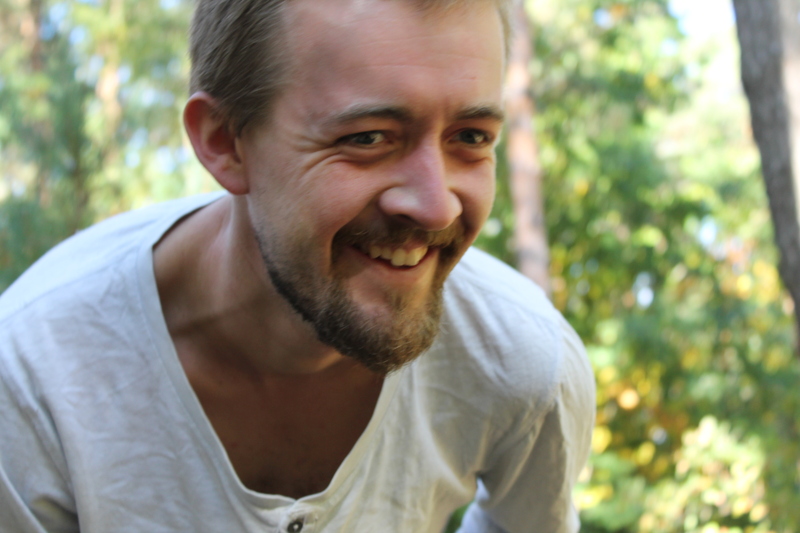 In conclusion we spent about three hours in the woods coming across the most various fringe-edibles – nineteen species according to Seb’s assiduous note-taking, including deer shield (Pluteus cervinus), plums and custard (Tricholomopsis rutilans – edibility contested), hen-of-the-woods (Grifolia frondosa – to which certain people can be allergic), witch’s eggs (embryonic form of the stinkhorn Phallus impudicus). The variety would have been great, were it not for the fact that a small percentage of the population could be potentially allergic to more than half of what we found – not exactly the kind of thing Seb and Dylan could offer their guests. Though both were very enthusiastic about the diversity of fungi we had found, it was disappointing to know they would have to skip the wild mushroom segment of their event. I was at a loss to explain the absolute absence of ‘choice’ fungi on such a vast area of forest. Even when not directly ingested, some mushrooms can trigger bouts of extreme good temperament, and happy crow’s feet. I noted down the area we had covered and planned to come back with a camera, to get some good photos of the more obscure of the edible fungi that had made Seb’s list that day. Yesterday, on the 29th September, the carpet of questionable edibles had been whisked away, and in its place, an eiderdown studded with ceps and other boletes. The whole forest was as if transformed since the last visit, which must have simply been in a different cycle in terms of fruiting species. Due to the sheer number of perfect ceps and bays, it required no great effort of will power to simply leave every third mushroom to hopefully drop its spores and fulfil its destiny for the two in the basket. Next year I plan to revisit these sites with much more frequency to see if any patterns of activity emerge: flirting with a logical pitfall? numerology? 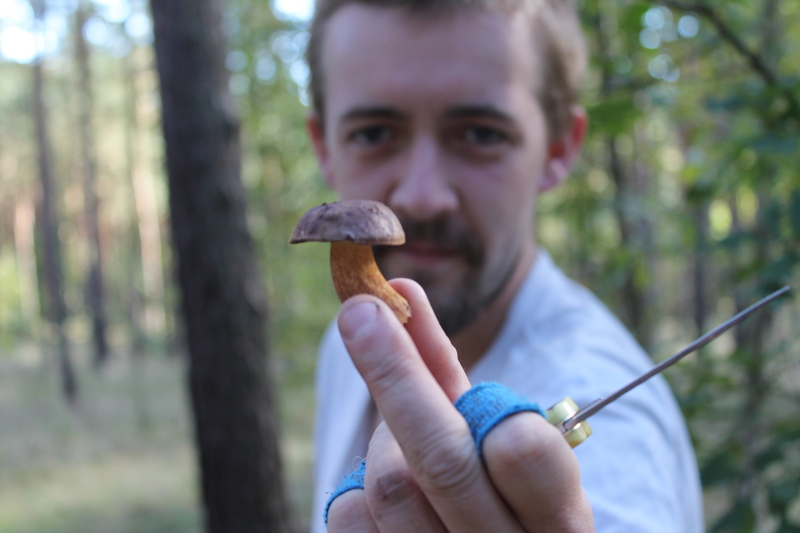 a game of mycological ‘whac-a-mole’? One of the above, at the very least. 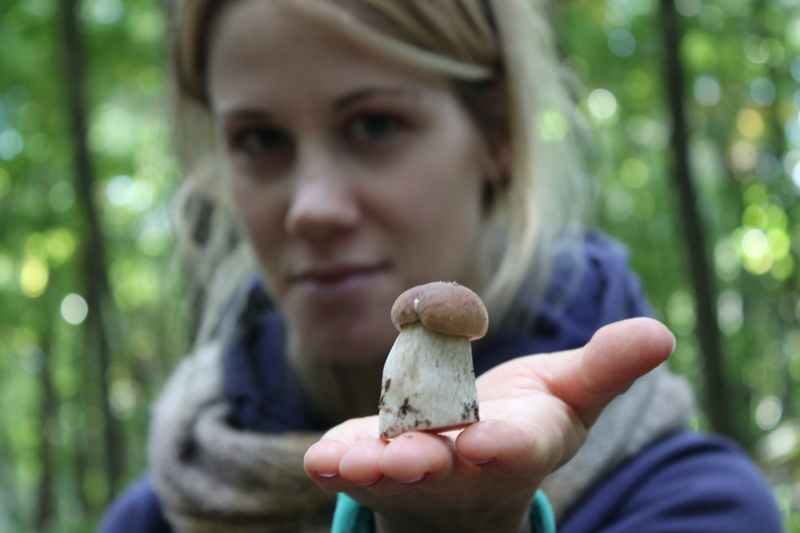 Fräulein F. with the ‘Schniedelwutz’ Cep. Stick that one in yer Google Translator.